Didn’t you all do well ! Russell Wingfield came 21st in the Open class at the Tet Champs. Russell was in 2nd place until the XC ! Musical Ride team competed for the first time. Beth Clegg Intermediate SJ. Had a clear 1st round but had poles down in the 2nd. Grassroots Regional Dressage team competed at Eland and came 10th. Sophie Sellers and Emily Entwistle. Maia Hodgson competed as an Individual in the Open Show Jumping, Dressage and Eventing. Maia was given 4th in the Horsemanship SJ Awards. Emmeline Davidson Slack – competed as an Individual in the Intermediate Event. Emily Entwistle came 9th in the Intermediate dressage to music. Ella Booth qualified and competed at the Tet Champs. Grassroots Regional Dressage Team won the Champs at Eland and Izzy Caldwell was 6th overall. 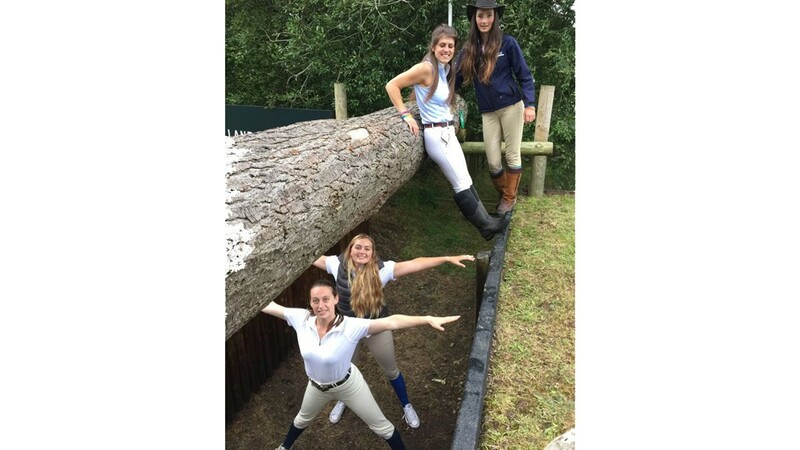 Intermediate Event Team – Tia, Sophie, Orla and Lexie. Tia came 3rd in her Section. Junior Games Team reached the final and came 6th – Florence, Ellen, Tabitha, Isadore and Felix. Intermediate Individual SJ – Kate finished on 4 faults and came 11th out of 75 competitors. Open Individual SJ – Lucy Lanni, Martha Newall and Rose Diggle. Out of 76 competitors, there were only 4 double clears and Martha was one of them. She came 2nd and Lucy 5th. Grassroots Regional Dressage team came 2nd. Amelia Deller and Phoebe Deller came 3rd and 4th respectively at Eland. Their SJ team came 4th overall at Eland. East Cheshire had an amazing 39 members competing at the Champs as well as two SJ teams at the Grassroots Regionals at Eland who came 6th and 7th. Amazingly their two Musical ride teams came 1st and 2nd. They were brilliant. Grace Anthony came 7th Nov Dressage to Music and Sam Foxall came 12th in Open Dressage to Music. Dressage – Novice Individuals – Jessica Taylor 3rd, Tasia Osborne 7th. Novice and Intermediate teams competed in the S. Jumping. Mounted Games Intermediate team came 10th. A Junior Horse and Pony Care team came 8th. A special mention to Sam Foxall who competed in Open Dressage, Open D to M, Pairs D to M, Intermediate SJ. and Intermediate Eventing. Ciara McLellen who competed in Open Dressage, Pairs D to M, Int SJ, Intermediate Eventing and the Musical Ride. Grassroots Reg Dressage – two teams competed at Eland and they were 6th and 7th. Intermediate Event Team – Sophie Wilson, Catrin Evans, Libby Edwards and Laura Cocking. Open SJ team 2nd – Brier Leahy, Lois Roberts, Sophie Toogood and Heidi O Brien. Ben Read competed as an Open Individual and came 9th. Open Event Team 1st (Team as above)and winning the prestigious Stonar Trophy. Heidi won her Section, Brier Leahy 3rd in hers, Lois Roberts 5th. Brier was named as one of the Horsemanship riders. Brier was one of only 4 to get a double clear in the Open Event out of 100+ competitors! Senior Games team came 7th. Mixed Area 5 Polocrosse team came 3rd.with Kate Davies. The Junior MG team won. The Junior H and Pony Care team won – Naomi Young, Pip Young, Kate Rutherford. Naomi Young won her Section in the Novice Event finishing on her dressage score. Cerys Jones and Timmy Orritt won the Pairs Dressage to Music. Amber Wilkinson and Hannah Burgoyne competed as Individuals in the Novice Show Jumping . Grassroots Regional – team of Leah Harding, Elin Pryce, Jasmin Teague and India Wilkinson won the Area competition and came 8th at the Eland Champs. Emily Boothroyd competed in the Ind Intermediate Dressage. Hamish Peffers qualified and competed at the Junior Tet Champs in Bishop Burton. A Team competed at Eland and came 13th out of 25 teams. This is approximately 150 Area 5 members. I am sorry if there are mistakes and/or I have missed anyone off. Let me know if you want anything changed. A huge THANK YOU must go to all the Volunteers, Parents and DCs who have given up so much of their time to enable these members to have the opportunity to compete at Cholmondeley, Eland and Bishop Burton.